A customized resume tailored to the cruise industry is vital to getting noticed by a cruise line recruiter. Recruiters don’t want to see a resume that they know you’ve used when applying to other jobs. 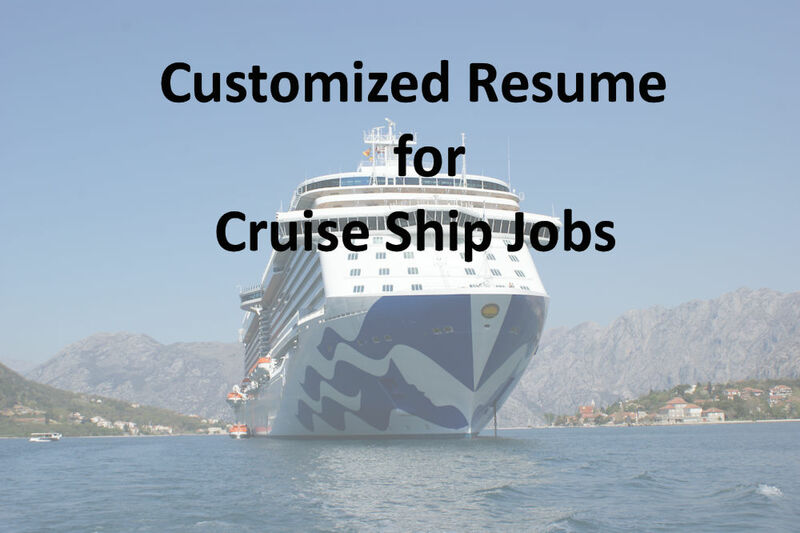 Cruise line recruiters want to think that you have custom written a resume with their company in mind. Your professionally Customized Resume will highlight your experience, skills, and qualifications using cruise job specific keywords and verbiage that mimics the description of the job you are applying for. This will optimize your chances of being offered an interview with a cruise line. Our products and services are only available for purchase on the website, www.Etsy.com in the store CruiseJobResources. Upon paying for your Customized Resume, you will work directly with me in a personalized and collaborative process. I will also offer you FREE revisions for 30 days until you are 100% satisfied. ►Once you have purchased your Customized Resume service, you will receive a Resume Consultation Questionnaire which I need you to complete. Please try and answer all questions with as much description as you can. This will help me to get to know you better and as a result create a resume that will stand out among other applicants. After I review your current resume and your completed Resume Consultation Questionnaire, I will email you your Cruise Job Consultation Summary. This summary itemizes which cruise ship jobs I think you are most suited to as well as which hiring partners you should apply to based on your country of residence. I will then ask for you to confirm which cruise ship job you want me to customize the resume for. Once you confirm to me which cruise ship job you want to apply for, I will prepare your Customized Resume. Your Customized Resume will be Applicant Tracking System (ATS) compliant using cruise job specific keywords and cruise industry verbiage. I don’t use colour, graphics, unusual fonts or text boxes since Applicant Tracking Systems typically overlook resumes that include such features. The final product is a digital file of your Customized Resume. It is not a physical item and it will not be shipped, only sent by email. I will offer you FREE revisions for 30 days until you are 100% satisfied. Your Customized Resume will be completely editable in Word format so that you can make your own changes in the future. Within 48 hours of your purchase, I will send you an email to confirm your order. It generally takes 2-3 days for me to completely review your current resume and your completed Resume Consultation Questionnaire before emailing you your Cruise Job Consultation Summary. Once you have responded by email to my recommendations in your Cruise Job Consultation Summary, I will prepare your Customized Resume. Depending on my workload, it generally takes between 4 – 7 days to complete your Customized Resume and email it to you. Once you have paid for your service and have forwarded your resume and questionnaire to me, there will be no refunds. You acknowledge that my time communicating with you, reviewing your materials, or providing services is compensable. However, I will offer you FREE revisions for 30 days until you are 100% satisfied with your final product. For more information, please refer to the Terms and Conditions page.